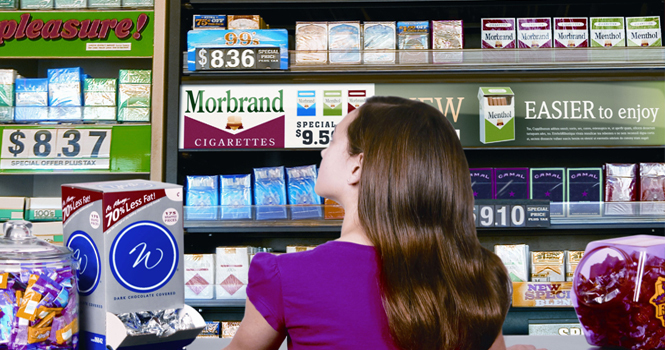 Tobacco companies specifically target kids and those trying to quit through point of sale marketing: unavoidable product placement at convenience store cash registers, low prices, and prime branded imagery below 3 ft. Unfortunately, this advertising is not limited to gas stations and convenience stores. Even in some of our local grocery stores, branded promotions are visible at the cash register to all customers regardless of their age. Tobacco companies pay $27.1 Million annually, in Montana alone, to concentrate their products and branded images at the checkout of our local stores. It works! ALL shoppers, regardless of age or smoking status are here exposed to pro-smoking messages. Don’t forget the flavored tobacco products packaged to look like candy and often placed near or among the cash register’s candy display; sure to attract a child. Almost all Gallatin County tobacco retailers (99%) have pro-tobacco messaging visible to every customer, regardless of age. The majority of Gallatin County tobacco retailers advertise and promote products more popular among teens than adults: Marlboro Reds (94%), Grizzly Chew (76%), Single flavored little cigars (65%), and e-cigarettes/e-hookah (78%). 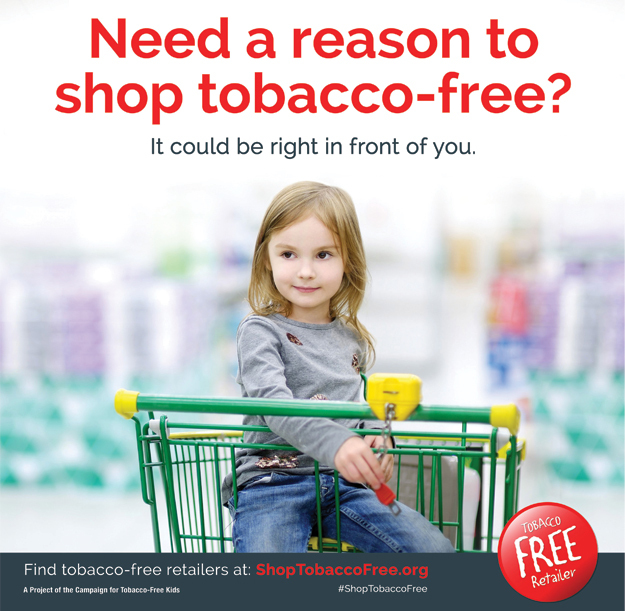 12% of Gallatin County tobacco retailers directly advertise to children by placing branded messaging or tobacco products below three feet within the store. Nearly 1 in 5 Gallatin County tobacco retailers target those trying to quit by ensuring price promotions and discounts are visible without even entering the store. A single candy flavored cigar can be purchased for as little as 49 cents. A single candy flavored cigar can be purchased for as little as 49 cents. Ninety percent of Gallatin County tobacco retailers who sell single candy cigars sell them for under $1. Use Map to explore how tobacco products are marketed to our Gallatin County youth. The goal of this gallery is to document point of sale activity within Gallatin County, MT and to create awareness of the issue among community members, retailers, and local decision makers. Share your point of sale images of tobacco advertising in Gallatin County by uploading them to Instagram and using the hash-tag #reACTHealthyGallatin. We are looking for your own photos of retail advertising, promotions, or merchandising displays. Also welcome are photos of health warnings or restricted product displays. If you don’t have Instagram, no problem; simply e-mail your images to jen.macfarlane@gallatin.mt.gov. Point of sale advertising is powerful! Think about it… every purchase is conducted at the cash register. The cash register or checkout counter is the one unavoidable area of the store where every shopper must go. From a very young age, we are held captive at the point of sale to hundreds of images and messages promoting positive feelings to associate with different brands. Here, we form lifelong relationships; Coke, Pepsi, Lays, Extra, Marlboro, Camel, Budweiser. Unfortunately, most of the time, these products are the least healthy if not downright damaging to our health. Point of sale advertising is especially dangerous when combined with highly addictive substances. Unavoidable advertising combined with price reductions triggers craving and impulse purchasing. The next time you fill your gas tank, go inside the convenience store; notice where the flashy colorful e-cigarettes and flavored nicotine cartridges are “conveniently” placed. The more tobacco marketing kids see, the more likely they are to smoke.